Econochill Xeroes in on Zoho Books to manage its finances. "I chose Zoho Books over Xero because it has sales order which is a critical component of my business. Zoho Books is simple yet complete and has everything that a small business needs- from sales to purchase." Christian Antalics and his business partners started Econochill in 1997. 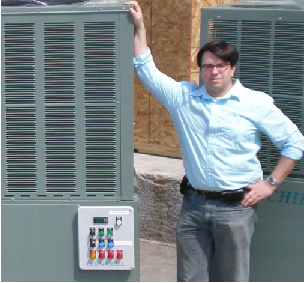 Their goal was to provide quality industrial refrigeration equipment at a better price point. Sensing this gap in the market, they set up a manufacturing unit to dole out tailor-made equipment for industrial and food processing businesses. As business grew, Christian went searching for a cloud-based accounting platform and found that Zoho Books met all his requirements. "Zoho Books has everything that a small business needs. It is straight-forward and lays out pretty clearly", says Christian. Christian was a QuickBooks desktop loyalist for years. However, the desktop application did not offer him the mobility he desired. "With QuickBooks desktop, one has to be physically present in his office to do the work. When I was traveling, I couldn’t do the work unless I have the computer with me. It was a tough situation," Christian recollects. With this, the search for a cloud accounting software began. Christian took Xero, New Zealand based cloud accounting software, for a spin. The fact that Xero lacked a sales order feature, which is an essential component of Christian's business, proved to be a damper on the software's appeal. Without sales order in his accounting software, he found it difficult to track the actual shipments against the order placed. He says,"Xero lacks sales orders, which is a critical component in the sales process. It has been two years since I tried using Xero and participated in their customer support forums, and I still get email notifications of current users asking when Xero plans to add sales orders." Econochill Xeroes in on Zoho Books! The quest to find accounting software that would support Econochill's business workflows, brought Christian to Zoho Books. With Zoho Books, he could easily send quotes to customers, convert them to sales orders upon acceptance, and send professional invoices upon shipment. Christian attributes the smooth transition to the cloud to the Zoho Books support team. "Anybody with or without an accounting background can manage their business finances with Zoho Books." Since switching to Zoho Books, Econochill has been successfully delivering industrial refrigeration equipment to customers without worrying about managing finances. With sights on expansion, Christian concludes,"Going forward, I would like to harness the capability of Zoho Books with its integration with Zoho CRM as I look to expand my sales level and hire outside salespeople."